Artemisia douglasiana is a biennial herb. The first year a stalk grows leaves, the second year flowers at the tip of the stalk. Artemisia douglasiana grows 3 to 4 feet tall. California Mugwort spreads by underground rhizomes and will gradually make a sizable colony. I have used the crushed leaves as a preventative measure for a poison oak allergic reaction for years. I crush and rub the leaves on the areas that may have touched the poison oak. And then clean up with soap and water as soon as possible after that. Artemisia douglasiana grows in seasonally moist areas, often along streambanks and seeps. 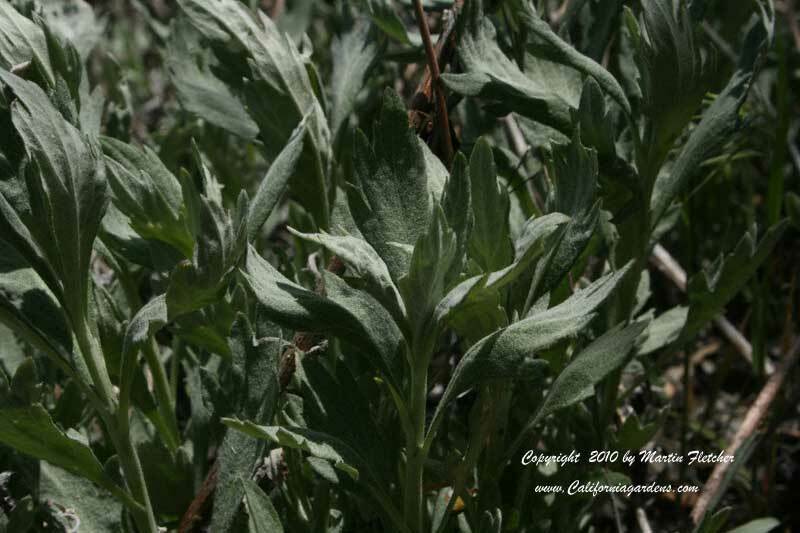 California Mugwort will grow in full sun if there is adequate moisture but can be found more often in a shaded area. Artemisia douglasiana is quite capable of withstanding a dry summer once established. Grey foliage of Artemisia douglasiana California Mugwort. High resolution photos are part of our garden image collection.